You will receive 1 wireless Infrared headphone Plus One 48" 3.5mm Double male Auxiliary cord. Enjoy music, movies and more! Automotive Grade IR Headphones: Will work on any vehicle that uses infrared headphones. No programming required! Simply turn on the headphones and they will connect to your vehicles rear entertainment system. IR Sensors: Uses infrared light to assure great sounding clear reception. Sound control: equipped with it's own volume control to suit your listening needs. Automatic Shut Off: Headphones will automatically shut off after 3 minutes when no audio is detected to ensure maximum battery life. Folding Design: Headphones fold neatly for compact storage. Comfortable Fit: Soft padded ear pieces and adjustable headband fits all head sizes and ensures a comfortable fit for hours of enjoyment. Two Channel: Will do everything a one channel headphone does but gives you the option to change between two different audio sources. For example, if you have two LCD screens in your vehicle and you want passengers to be able to watch two different shows, you will need a two channel headphone. 3.5mm Auxiliary Port: With this added feature, you will be able to use these headphones with any device that uses a 3.5mm auxiliary port. This allows you to plug these headphones into your Ipad/pod, MP3 player, Leap pad, or any device that uses a standard 3.5mm cord (included). Simply plug one end into your device and the other end into these headphones. No batteries required when plugged into a device with an auxiliary cord. Please Note: Volume is controlled when using an Auxiliary cord by the device it's plugged into. 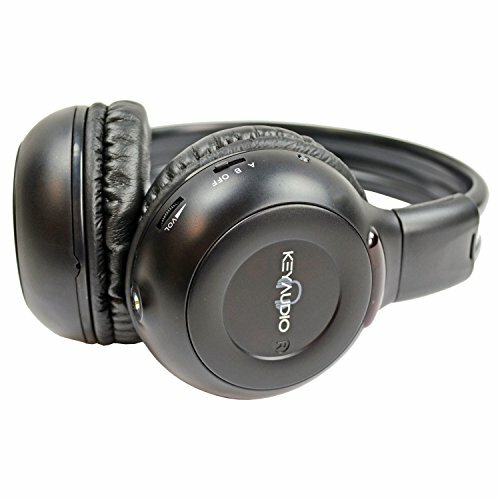 This headphone has superior sound and is competitve with much more expensive units on the sound quality. You can expect clear quality sound at the highest volume levels. Batteries: Requires two AAA batteries when used wireless. On-Off Buttons: Each unit has it's own On-Off button with a power on indicating light. These will not work if your screens are in the headrest and they are not Bluetooth Headphones. For IR systems only. If you have any questions about this product by Key Audio, contact us by completing and submitting the form below. If you are looking for a specif part number, please include it with your message.